Public transit agencies play an important role in the provision of safe, reliable, and cost-effective transportation for the communities they serve. With the growing intensity and frequency of extreme weather events, such as hurricanes Irene and Sandy, several public transportation agencies have begun to adapt their systems to make them more resilient to the changing climate conditions. 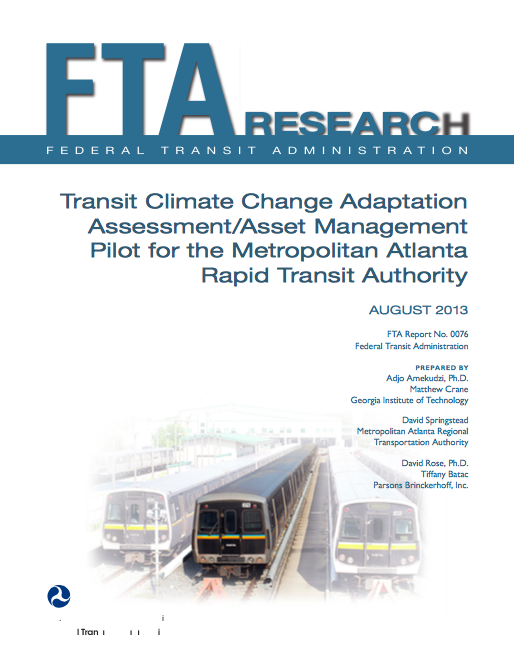 This report applies transit asset management principles to climate change adaptation using the Federal Transit Administration’s “Asset Management Guide.” Climate change adaptation generally involves understanding potential impacts of the changing climate on an agency’s services and assets and taking necessary actions to avoid, reduce, or manage anticipated impacts. For transit agencies, this involves identifying vulnerable assets and their associated risks and prioritizing improvements to develop more resilient systems while achieving other system performance objectives. Principles from the “Asset Management Guide” are applied to demonstrate how a pub­ lic transit agency can adapt to extreme weather events or changes in climate using the Metropolitan Atlanta Regional Transit Authority (MARTA) as a case study. The report outlines procedures for identifying the climate hazards and vulnerable assets and their associated risks in a transit agency’s service area. It identifies opportunities to integrate climate adaptation strategies in a transit asset manage­ ment system at the enterprise and asset levels and then link the resulting information to appropriate business units to manage risks while undertaking continual improvement and updates in the life cycle management of assets. Addressing climate change through asset management programs can help agencies achieve system resilience simultaneously with other system performance objectives such as safety, mobility and the state-of-good-repair.